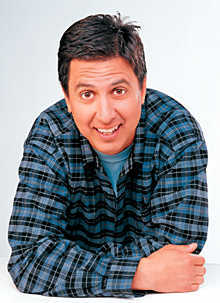 Ray Romano was born and raised in Queens, New York. After graduating from high school, Romano worked odd jobs while occasionally trying his comedy on open mike competitions at local nightclubs. In 1987, he turned professional, and he made a low-income living at comedy for several years. After a 1991 appearance on Johnny Carson's Tonight Show, he became a high-income comic. He moved into the very high income brackets when David Letterman offered to develop a situation comedy for Romano, loosely based on Romano's life and family: Everybody Loves Raymond. Like the sitcom's Ray Barone, Romano has twin sons, and his brother is a divorced cop with the New York Police Department. Like his sitcom counterpart, Romano was 29 years old before moving out of his parents' house. "Go ahead," says Romano, "say it. 'Loser!' Say it!" Romano may hold a record for 'crossover' appearances on other sit-coms, playing ELR's Ray Barone on episodes of Becker, Cosby, The King of Queens, and The Nanny (starring Fran Drescher, who attended the same high school as Romano, three years ahead of him). Inside the Actors Studio interview with James Lipton, June 19, 2005. LIPTON: "If Heaven exists, Ray, what would you like to hear God say when you arrive at the pearly gates?" ROMANO: "My son, I saw what you did in the garage, and you're still welcomed here. See, you were wrong -- I do exist!"